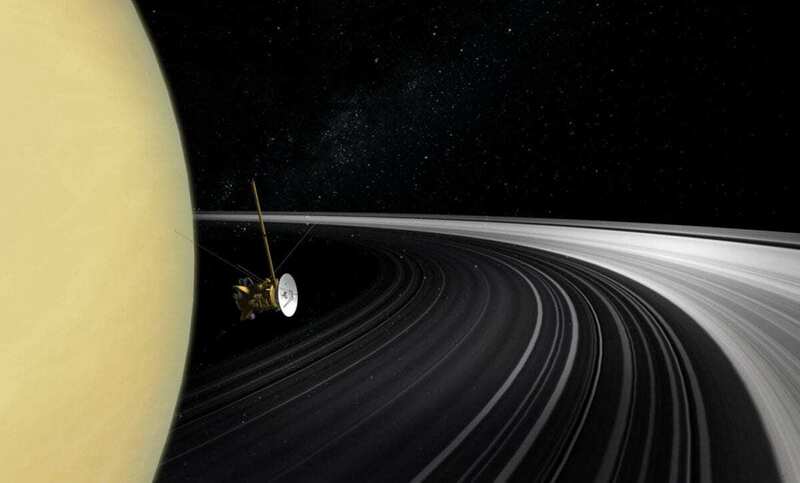 One of the last acts of NASA’s Cassini spacecraft before its death plunge into Saturn’s hydrogen and helium atmosphere was to coast between the planet and its rings and let them tug it around, essentially acting as a gravity probe. Precise measurements of Cassini’s final trajectory have now allowed scientists to make the first accurate estimate of the amount of material in the planet’s rings, weighing them based on the strength of their gravitational pull. Their young age puts to rest a long-running argument among planetary scientists. Some thought that the rings formed along with the planet 4.5 billion years ago from icy debris remaining in orbit after the formation of the solar system. Others thought the rings were very young and that Saturn had, at some point, captured an object from the Kuiper belt or a comet and gradually reduced it to orbiting rubble. The new mass estimate is based on a measurement of how much the flight path of Cassini was deflected by the gravity of the rings when the spacecraft flew between the planet and the rings on its final set of orbits in September 2017. Initially, however, the deflection did not match predictions based on models of the planet and rings. Only when the team accounted for very deep flowing winds in atmosphere on Saturn — something impossible to observe from space — did the measurements make sense, allowing them to calculate the mass of the rings. They also calculated that the surface clouds at Saturn’s equator rotate 4 percent faster than the layer 9,000 kilometers (about 6,000 miles) deep. That deeper layer takes 9 minutes longer to rotate than do the cloud tops at the equator, which go around the planet once every 10 hours, 33 minutes. Militzer also was able to calculate that the rocky core of the planet must be between 15 and 18 times the mass of Earth, which is similar to earlier estimates. The team, led by Luciano Iess at the Sapienza University of Rome, Italy, reported their results today in the journal Science. 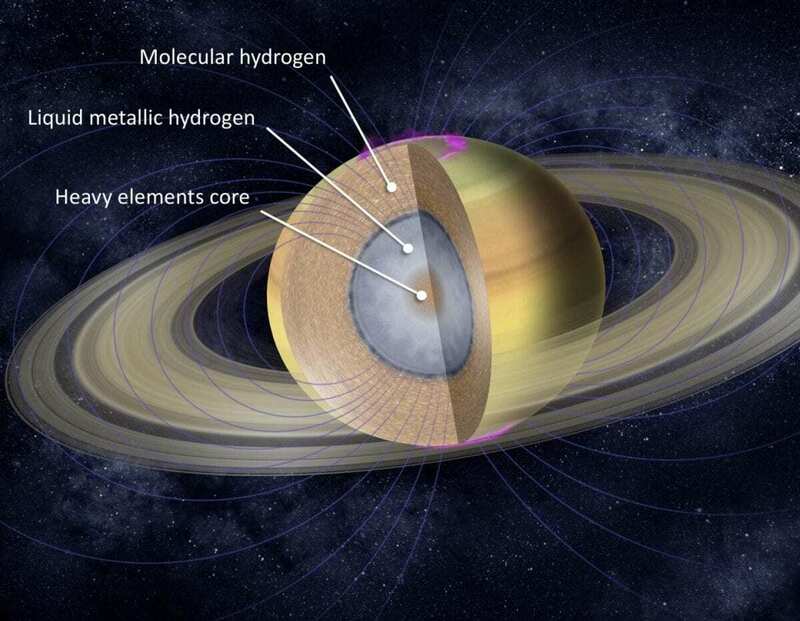 Earlier estimates of the mass of Saturn’s rings — between one-half and one-third the mass of Mimas — came from studying the density waves that travel around the rocky, icy rings. These waves are caused by the planet’s 62 satellites, including Mimas, which creates the so-called Cassini division between the two largest rings, A and B. Mimas is smooth and round, 246 kilometers in diameter. It has a big impact crater that makes it resemble the Death Star from the Star Wars movies. Luckily, as Cassini approached the end of its life, NASA programmed it to perform 22 dives between the planet and the rings to probe Saturn’s gravity field. Earth-based radio telescopes measured the spacecraft’s velocity to within a fraction of a millimeter per second. The new ring mass value is in the range of earlier estimates and allows the researchers to determine their age. These age calculations, led by Philip Nicholson of Cornell University and Iess, built on a connection that scientists had previously made between the mass of the rings and their age. Lower mass points to a younger age, because the rings are initially made of ice and are bright but over time become contaminated and darkened by interplanetary debris. Header Image – Artist’s concept of the Cassini spacecraft shown against a real photo of Saturn and its rings as Cassini crossed the ring plane. Credit : NASA/JPL-Caltech.